An introductory textbook for senior/graduate couses in finite element analysis taught in all engineering departments. Covers the basic concepts of the finite element method and their application to the analysis of plane structures and two-dimensional continuum problems in heat transfer, irrotational fluid flow, and elasticity. This revised edition includes a reorganization of topics and an increase in the number of homework problems. The emphasis on numerical illustrations make topis clear without heavy use of sophisticated mathematics. 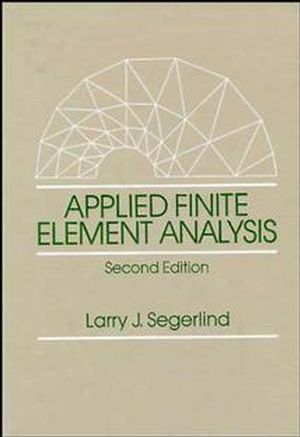 Larry J. Segerlind is the author of Applied Finite Element Analysis, 2nd Edition, published by Wiley. Derivative Boundary Conditions: Point Sources and Sinks. Heat Transfer by Conduction and Convection. Time-Dependent Field Problems: Theoretical Considerations. Time-Dependent Field Problems: Practical Considerations. Computer Program for Two-Dimensional Field Problems. Element Matrices: Potential Energy Formulations. Computer Programs for Structural and Solid Mechanics.